Saints Mark the Grave-Digger, Theophilus and John are mentioned in the Kiev Caves Paterikon. Two brothers being monastics, Saints Theophilus and John, so loved each other that they prevailed upon Saint Mark to prepare a double grave so they could be buried side by side. The cave-dweller Mark, bowed humbly to Saint Theophilus and asked that he forgive him. Turning to the dead man, he said, “Arise, give this place to your older brother, and you lie down in the other place.” And the dead man moved to the lower place in the grave. Seeing this, Saint Theophilus fell down at the knees of Saint Mark begging his forgiveness. The cave-dweller Mark told Theophilus that he ought to be concerned for his own salvation, because soon he would join his brother in that place. Hearing this, Saint Theophilus became terrified and decided that he would soon die. He gave away everything that he possessed, keeping only his mantle, and every day he awaited the hour of death. No one was able to stop his tears, nor to tempt him with tasty food. Tears were his bread by day and by night (Ps 41/42:3). God granted him several years more for repentance, which he spent in fasting and lamentation. He even went blind from continuous weeping. The words of the saint were fulfilled. 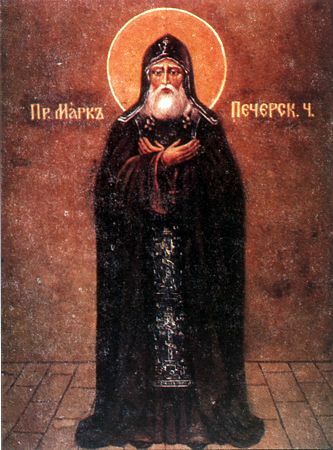 The body of Saint Theophilus was placed in the Antoniev Cave in the grave together with his brother Saint John, near the relics of Saint Mark. Their memory is celebrated also on September 28 and on the second Sunday of Great Lent.